Prep. Time: 7 min. | Cooking Time: n/a min. 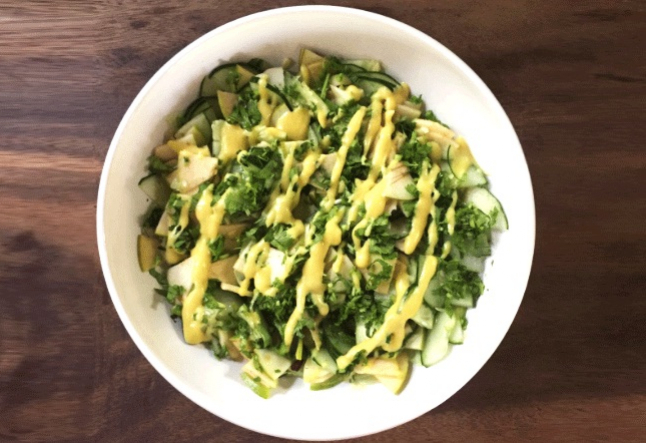 This refreshing salad is a perfect staple salad in the summertime! Wash and cut the apples into fine slices. Slice the cucumber with a mandoline (if you don't have a mandoline, then chop the cucumber into bite-sized pieces). Finely cut the cilantro. Place the ingredients in a serving bowl. Prepare the dressing by stirring together the olive oil, salt, lemon juice, and the grain mustard. Adjust the amounts accordingly to your taste. Pour the dressing onto the ingredients and lightly mix. If the apples and cucumber are organic, keep the skin on, otherwise remove it.